Curries don't have a venerable ancient dynastic history; nobody claims they were invented on the banks of the Yellow River in the Ming. But it's an indisputable fact that curry has caught on and is now very popular Mainland fare. It's not considered "exotic" here; it has been adopted and assimilated. Curry is also big in Japan and Korea; same is true in much of SE Asia, notably Thailand, and even down into Malaysia and Indonesia. All over China you can find it listed on the short tabletop or wall menus of small family-style restaurants right beside traditional favorites like hongshao rou 红烧肉 (red-cooked pork.) 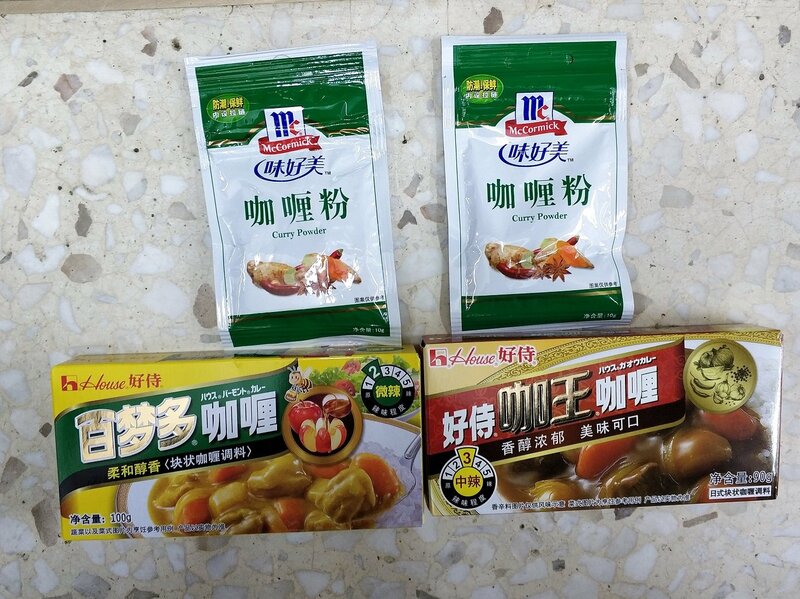 Simple grocery stores patronized by local people here in Kunming often have six or eight kinds of curry spice blends available for sale, attesting to demand. 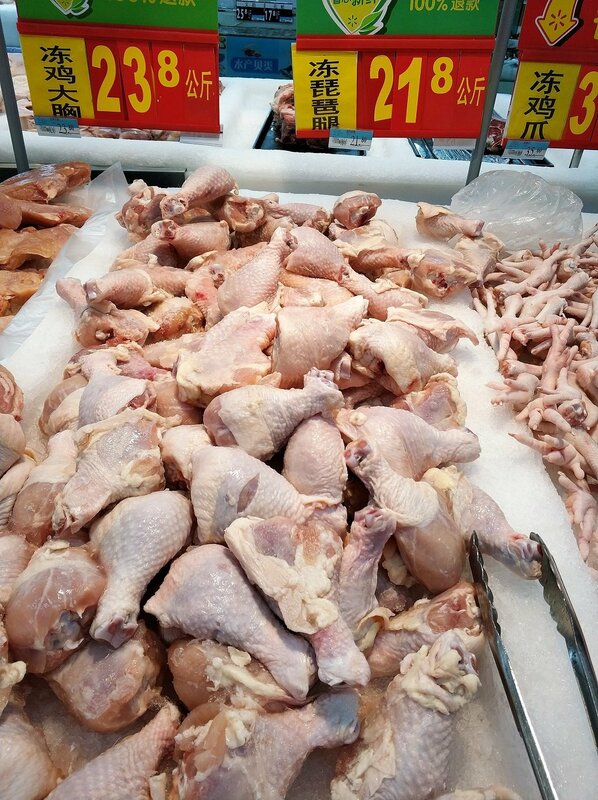 Chicken curry and beef curry have both become favorites in my own simple kitchen; today I'll show you how to make a killer Middle-Kingdom version with the humble chicken leg 咖喱鸡腿。Frozen chicken drumsticks 冻琵琶腿 (pipatui) are cheap and plentiful; they are what I used today. Six of these cost about 20 Yuan (weight 900-odd grams, nearly a kilo.) I picked up a couple potatoes and a couple carrots plus one medium sized onion. Sprung for an optional apple and one ripe tomato. 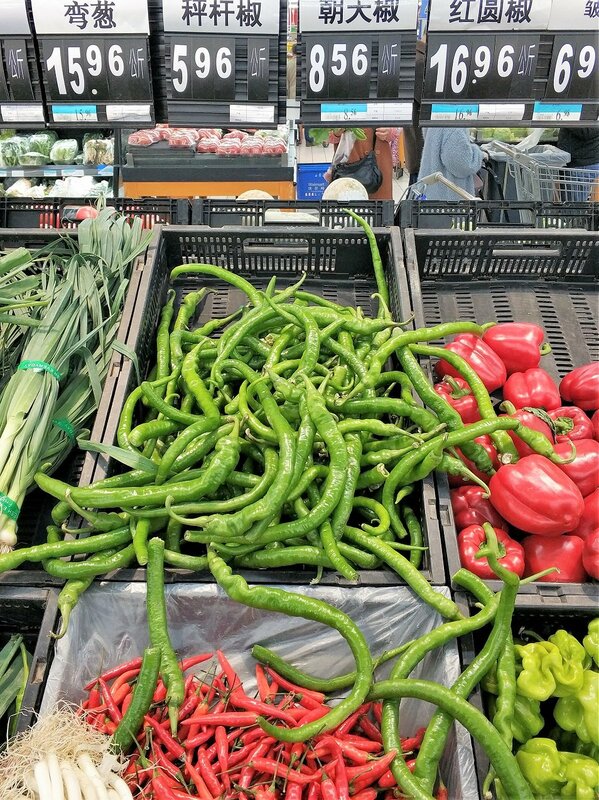 As an afterthought, I bought a few spicy long green chilies to increase the heat. Figured that would give the dish a nice Yunnan touch. 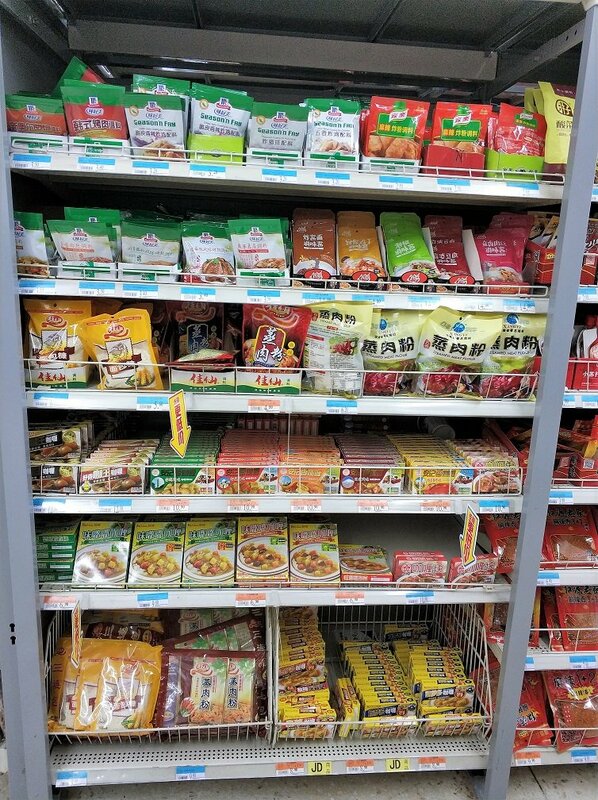 When I headed to the spice aisle, I found lots of different curry seasonings. The most popular kind here is sold in solid blocks. 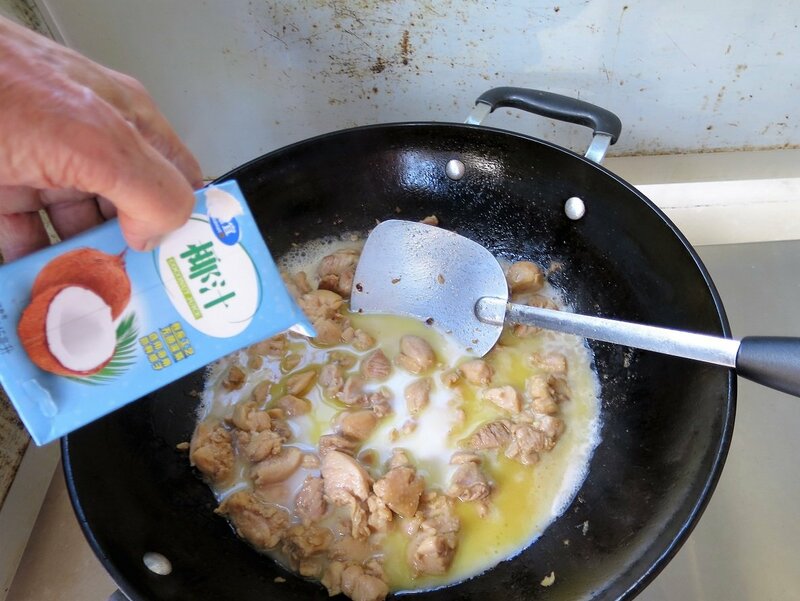 Chinese cooks claim the flavor is more robust, but one can also buy several brands of curry powder. Most of these spice blends are graded as to their "fire quotient." The kind I bought today was marked 微辣, or barely hot; category 2 on a scale of 1 to 5. I'd rather add spiciness by means of actual peppers, fresh or dried. Seems to me the results that way are better balanced and less likely to yield an unwelcome last minute surprise. Here's a closer look at my curry cubes and a shot of the coconut liquid I bought. 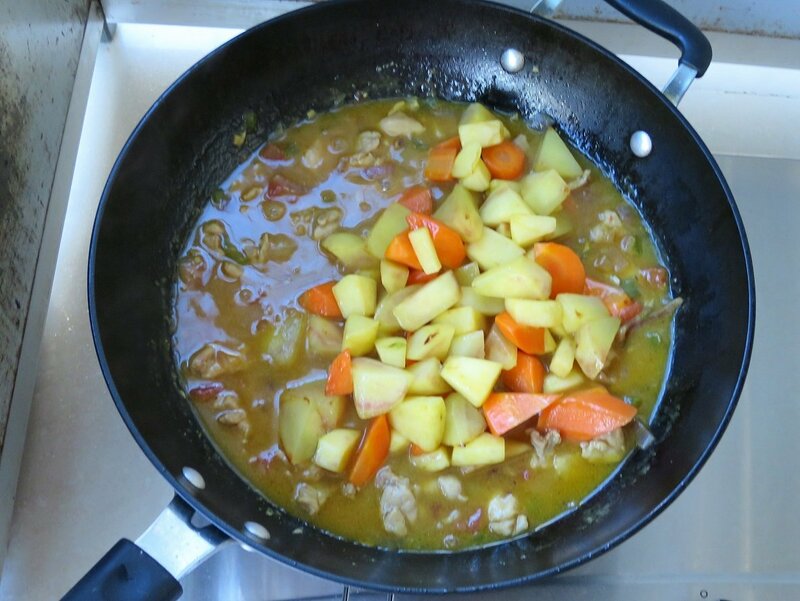 Curry comes in all sorts of flavor profiles, the one I made today had apples and coconut to offset the heat. Chinese "take-out" curry in the US often is mainly meat and onions. Today's edition is a little more complex and interesting. 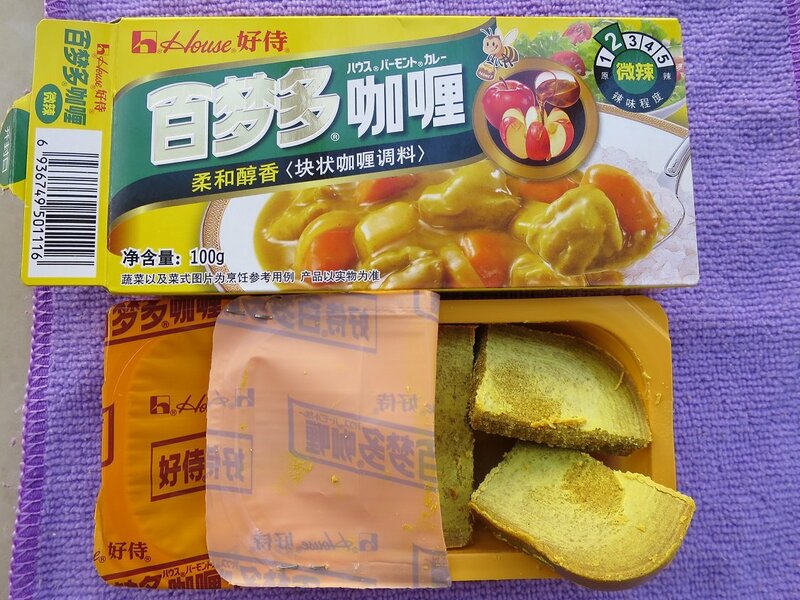 This brand of curry cubes, House or 好特，is what I usually buy and has been dependable. Note the circular "heat meter" in the upper right corner. 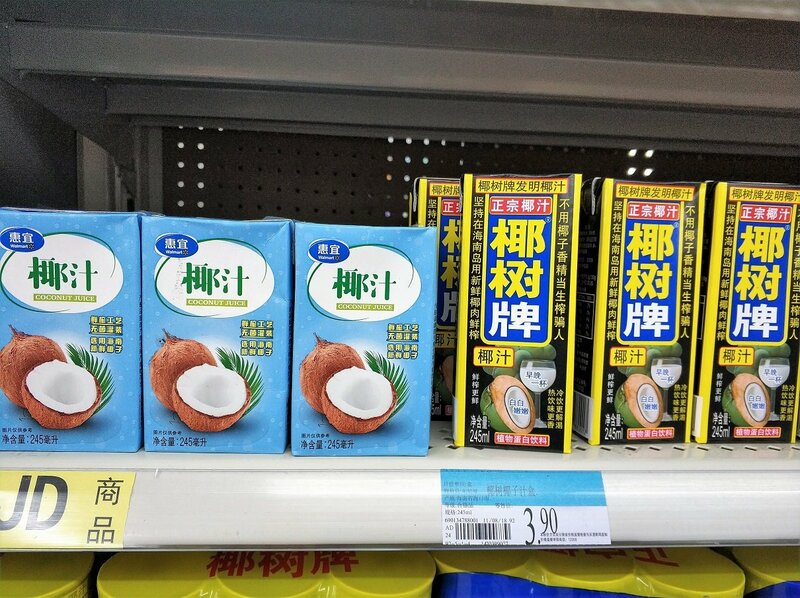 The store only had this coconut drink 椰汁, and not the more concentrated 椰奶 that I would have preferred, but it still served the need. 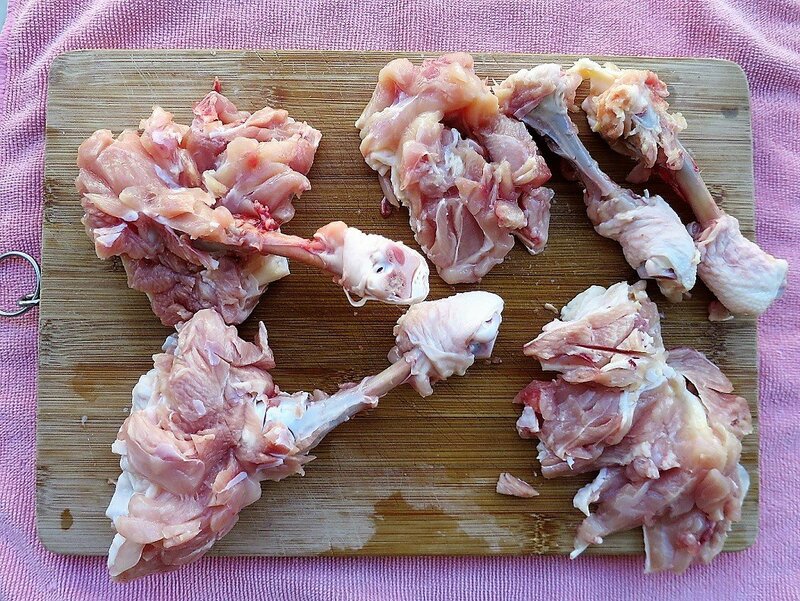 One can rudely hack the chicken legs into pieces with a heavy cleaver, leaving the bones in place. That is the "family style" approach 家常菜 used in lots of small mom and pop, open-front eateries. Today I decided to cut the meat off the bone; it's a more elegant approach and doesn't really take much time. Wound up with about 650 grams of usable meat and some bones that I will freeze for stock. 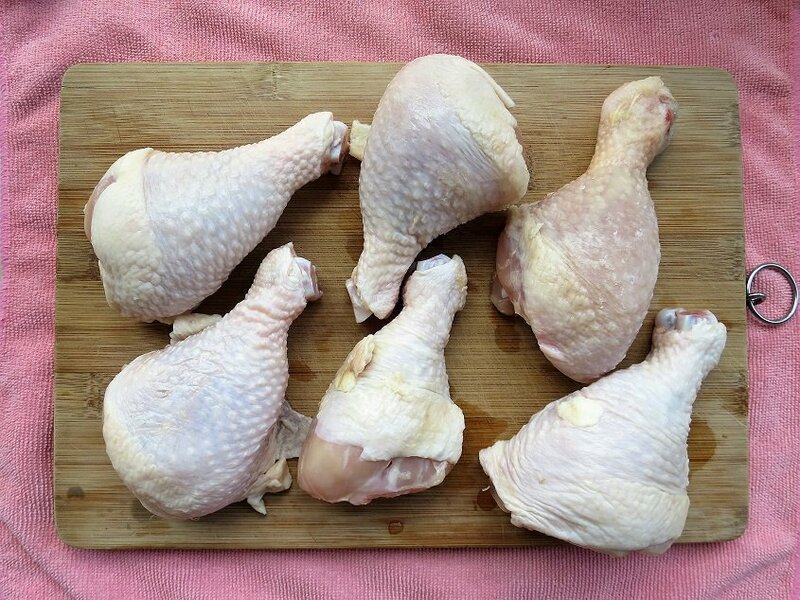 What you do is first make a circular cut all the way around the smaller end of the drumstick. Then slice along the bone, working in the direction of the larger joint, producing a "lollypop" effect. Then sever this leg meat that you have sort of "turned inside out." 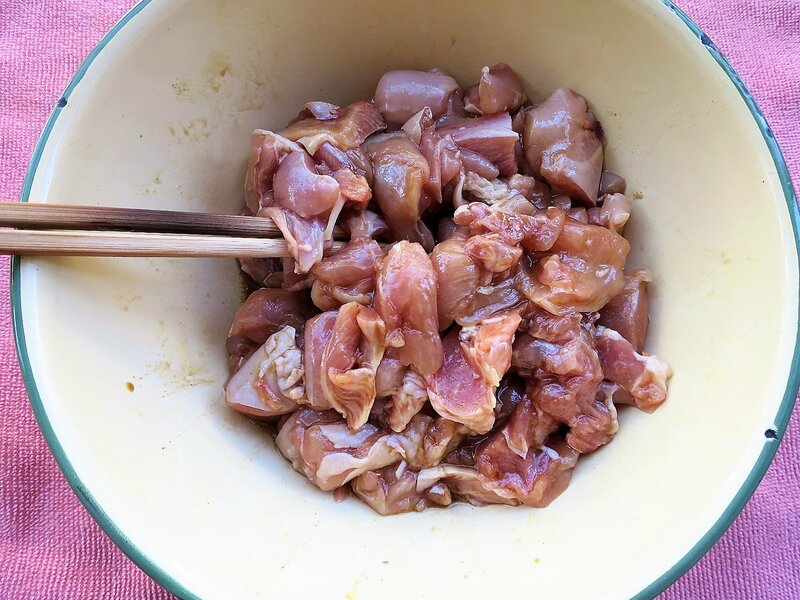 Cut it into smallish pieces so that it cooks more evenly and is suitable to eating with chopsticks. If you want to remove some of the shiny white tendons with the tip of your knife, your guests will thank you and Gordon Ramsay won't shout loud obscenities in your direction. Wash and cut the vegetables. 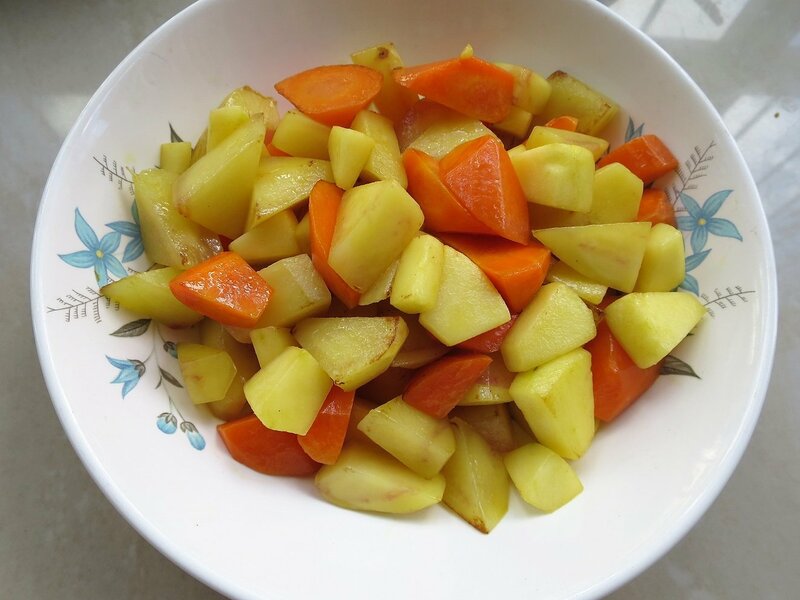 In addition to the onion, potato, carrot, apple, tomato and peppers already mentioned, I used a large clove of garlic 独立蒜 and about an inch of ginger 老姜, both of the latter minced. I took the skin off the tomato by dunking it in boiling water for half a minute. The apple proved too big, and I only used half of it. Nibbled the remainder -- cook's prerogative; the spoils of war. Should mention that before prepping the vegetables, I put some rice on to soak. Wanted to have the finished curry with fresh steamed rice. I would start the rice cooking after it soaked 15 minutes. First order of business is to make the curry base. 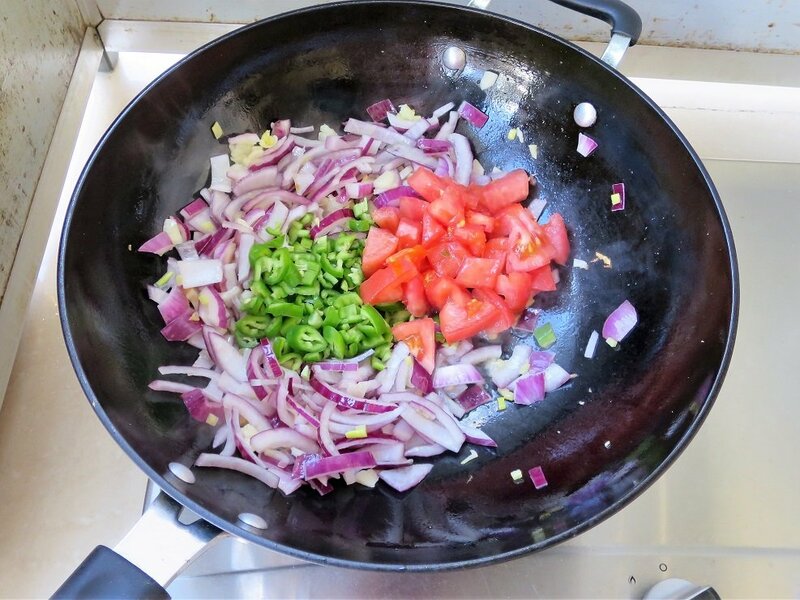 Did that by stir-frying 煸炒 the ginger and garlic for a few seconds, added the onion and continued to stir for a minute more. 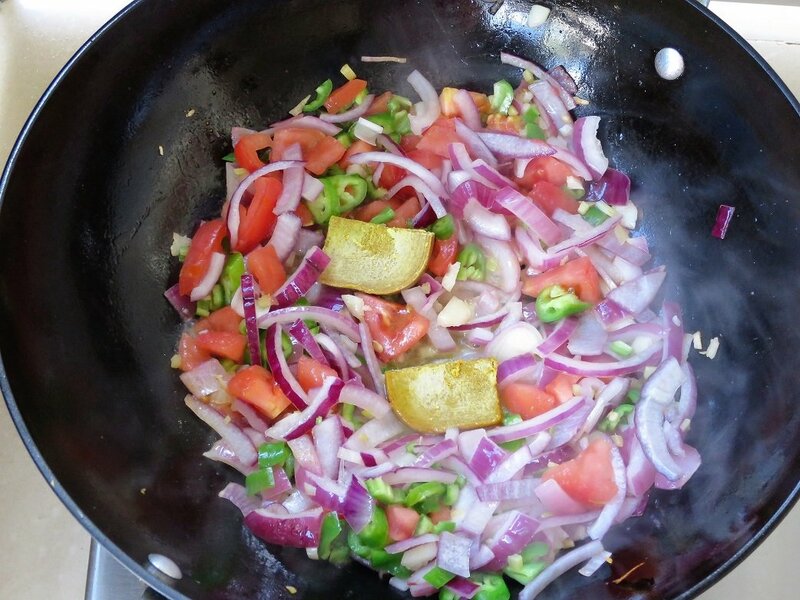 Next, put in the the green peppers. When all these have begun releasing their aroma and have wilted down (without really becoming brown,) then add the tomato. Poured in one rice bowl of hot water (about 250 ml.) and put in the curry blocks. Stirred them well to dissolve. Put on the lid 盖上盖, turned the fire to it's lowest setting 小伙, and cooked this sauce 15 minutes, peeking and stirring several times. 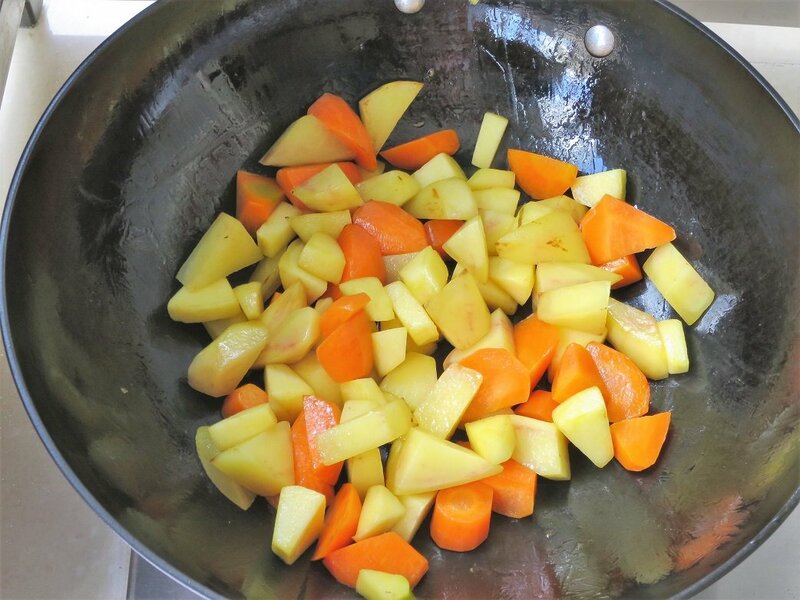 Saute the potatoes and carrots until you see a little bit of color developing. No need to actually make them golden brown. Ready now to cook the chicken, which has been marinating in the fridge. Hot wok, cold oil 热锅冷油 (old Chinese kitchen saying.) 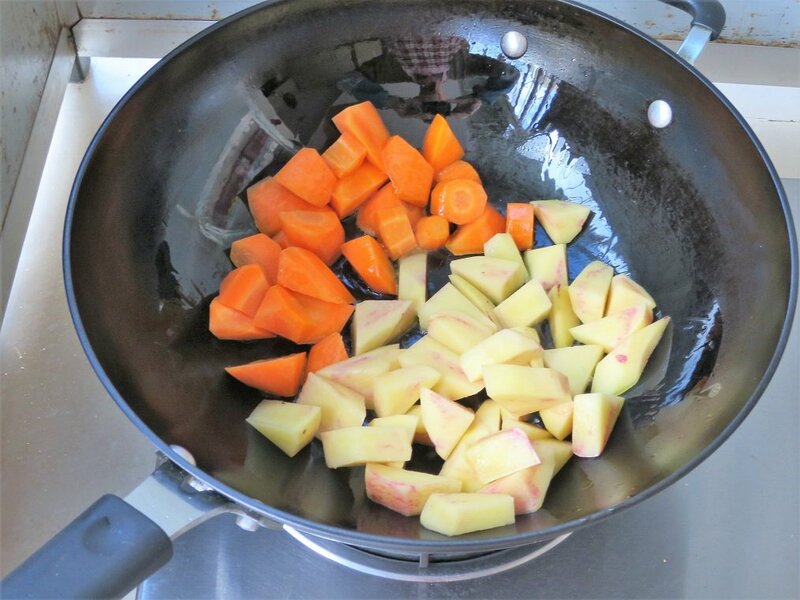 Stir fry 翻炒 it over high heat until you no longer see surface pink. The illustration below left shows that it still needs more time. Be careful, however, not to dry it out. Add the coconut milk. Curry recipes often call for adding sugar or even honey, but since this coconut milk is sweet, as are the apples, I didn't use any. Next add the curry base that you already prepared. Stir it well. Add some additional hot water if it looks too dry. Cover and cook on low for 15 minutes, stirring every few minutes 焖煮。This lets you check the progress and prevents it from sticking to the bottom of the wok. 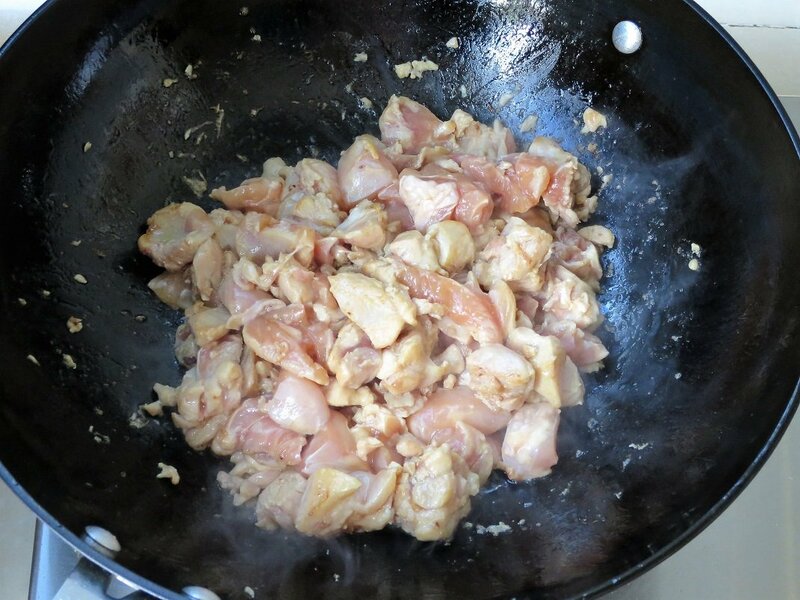 By now the chicken is cooked through 熟透 and the flavors are well developed. Time to return the vegetables to the wok and allow it all to marry. Cover and give it 15 minutes on low. Near the end of that time, check the potatoes and carrots to see if they pierce easily with a fork. This will let you know that they are done. Taste and adjust the salt (mine needed a little extra.) 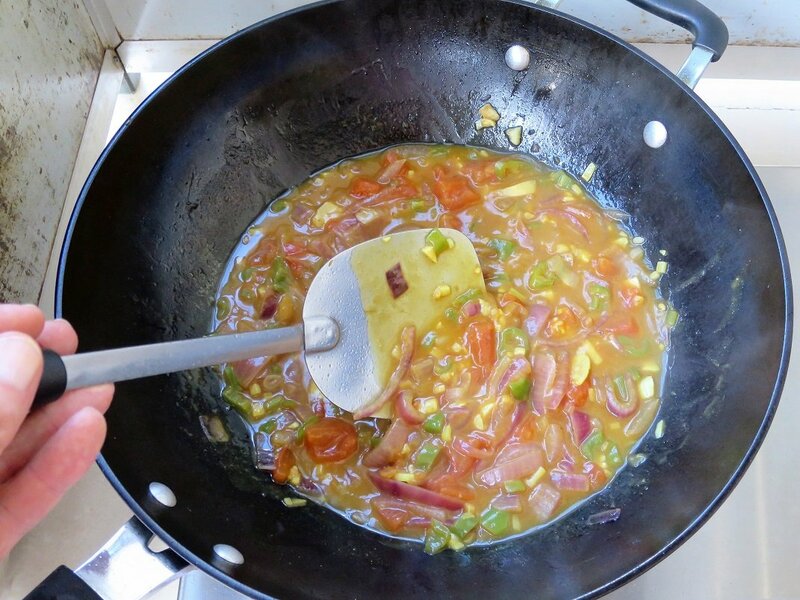 If there is still lots of liquid, turn up the flame and leave the lid off for a minute or so, stirring as it reduces. 至汤汁浓稠。Don't make it too dry, however, because that flavorful juice is delicious over rice. By now your rice is done, tender and piping hot. Notice the little steam holes telling you it's ready. 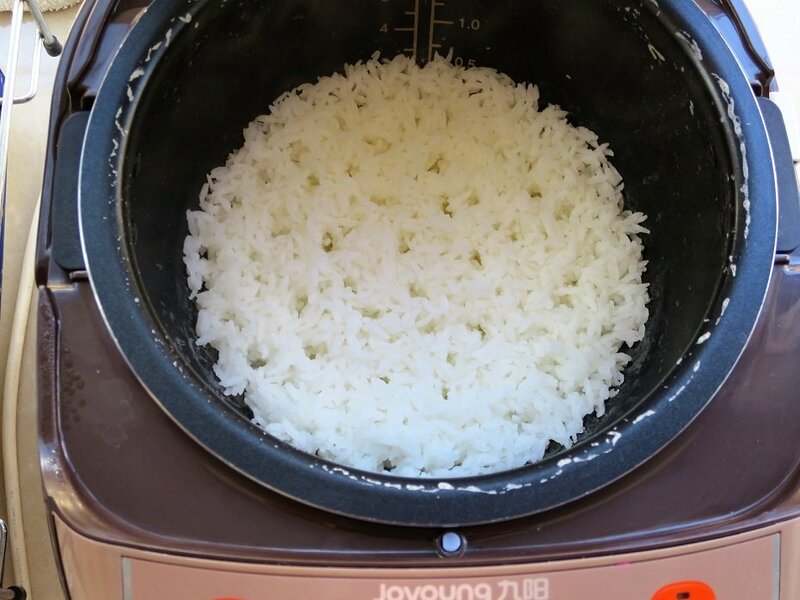 Fluff it up with a pair of chopsticks and leave it in the rice cooker. Close the cover to keep it warm, but unplug it so that it does not continue to cook. The "keep warm" 保温 setting supplies too much heat. Time to eat. What I usually do is serve the first round as individual plates 盖饭 gaifan style to get everyone started. Then set the remainder of the curry on the table so my friends can help themselves to seconds (and thirds, and fourths.) The rice stays in the rice cooker, off to the side but within arm's reach. Hope you try it soon. One point three billion Chinese are unlikely to be wrong. Very nice presentation! Thank you for all the trouble you take in your posts. Sadly, I never have all the required spices and if I do, chances are they are very old and probably not very healthy. Much easier for me to open a jar with a good Malaysian or Singaporean curry sauce. Even Marks & Spencer's have quite decent ones. I still admire your presentations very much. Appreciate your kind words, @Luxi -- I'm truly fortunate to have easy access to lots of prime fresh ingredients here. This is one of my go to recipes, and if you make too much, it freezes nicely. I usually make a hyge pot on a weekend and vacuum seal it to to take to work for lunch over 5-7 meals. 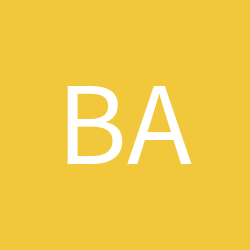 Do you use curry powder or curry blocks in the US? I see hard-core gourmet articles urging me to make my own from scratch, toasting and grinding up all the requisite exotic leaves and seeds and pods. Never tried it; probably won't unless I were to somehow be convinced it was worth the extra trouble. I end up getting Chinese food after every one of your food posts. Looks delicious! Haha! Thanks for posting. Do you ever try making these dishes at home? This recipe has more moving parts than some, but doesn't contain any "critical steps" that must be done just exactly right to prevent disaster. 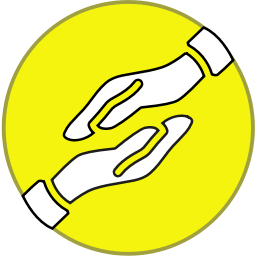 If you feel inspired to try, I'd be glad to talk you through any snags or problem areas. 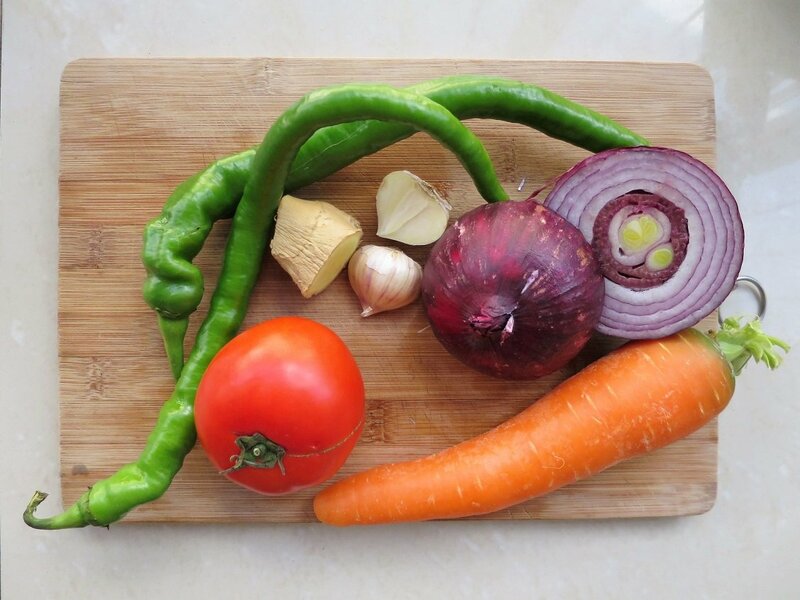 A great looking recipe, abcd! There are chicken curry restaurants popping up all over the place now. When I first arrived 2-3 years ago, it was 麻辣烫 and 麻辣香锅 on every corner. Now, many of these places have closed down and are being replaced with chicken or beef curry. It seems to be really popular with the 外卖 crowd, too. I often see my Chinese classmates getting it - smells great when they open the box. I've never had it in a Chinese restaurant nor made Chinese curry. 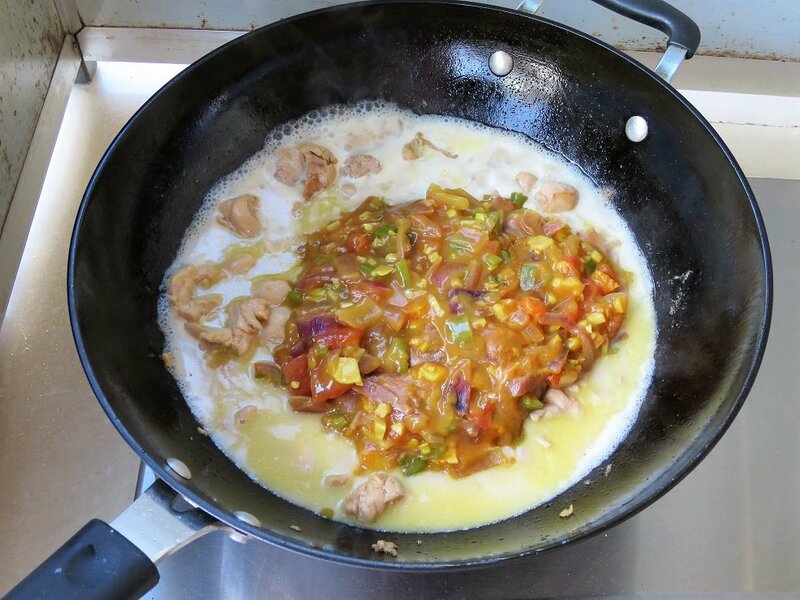 The pastes/sauces usually have chicken or beef in them, but I often make Thai curry at home. I've never had an apple in a curry before, though. This sounds pretty interesting; is it typical in Chinese curries? 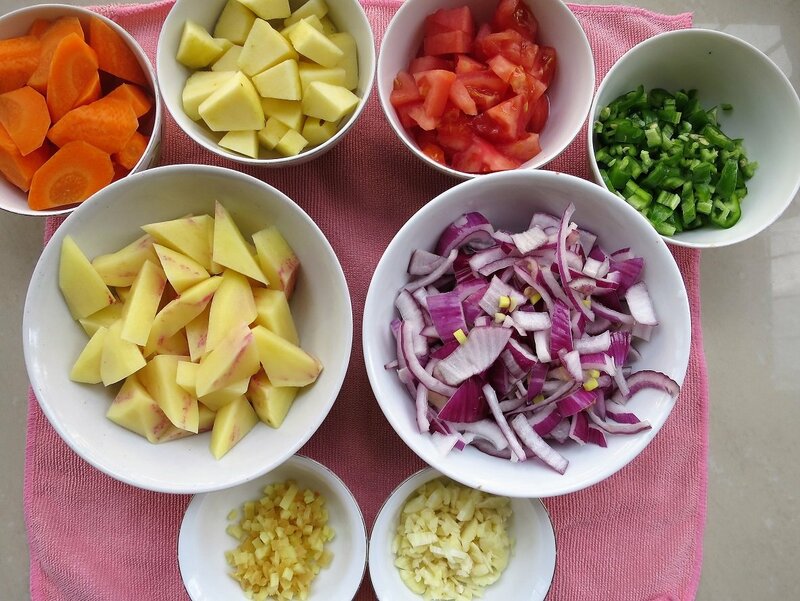 I've made curry pastes (Thai) with a pestle and mortar several times. Handmade pastes add a lot more flavor and a nuance that the storebought ones lack, and I keep a pretty huge spice cabinet in my kitchen so I never really have the problem of having to buy spices, but you are right. It is a lot of extra trouble. I have many Thai friends who say their mothers do it weekly, but I can't imagine myself doing it for anything other than a special occasion. I imagine it's relatively similar to the Chinese curry blocks. I'd suggest you try it at least once if your spice cabinet permits. It is also a good work out! I usually make a hyge pot on a weekend and vacuum seal it to to take to work for lunch over 5-﻿7 meals. Do you vacuum seal it in bowls or just in a bag, e.g. when you get to the office, do you just pour it into a bowl from the bag? I've never had a vacuum sealer, but this sounds cool. I vacuum seal in a bag. Pop the bag in the microwave for couple of minutes.cut the top and pour over some steamed rice. I use foodsaver bags that I get from Costco. Which. I also use to sous vide. On their website, Foodsaver say these bags are safe to microwave. I use a vacuum sealer in the US. Very handy. I've never had an apple in a curry before, though. This sounds pretty interesting; is it typical in Chinese curries? I'm not sure whether it's typical or not. Kind of doubt it. Read several Chinese recipes early on which suggested that addition, so I shamelessly adopted it as my own. 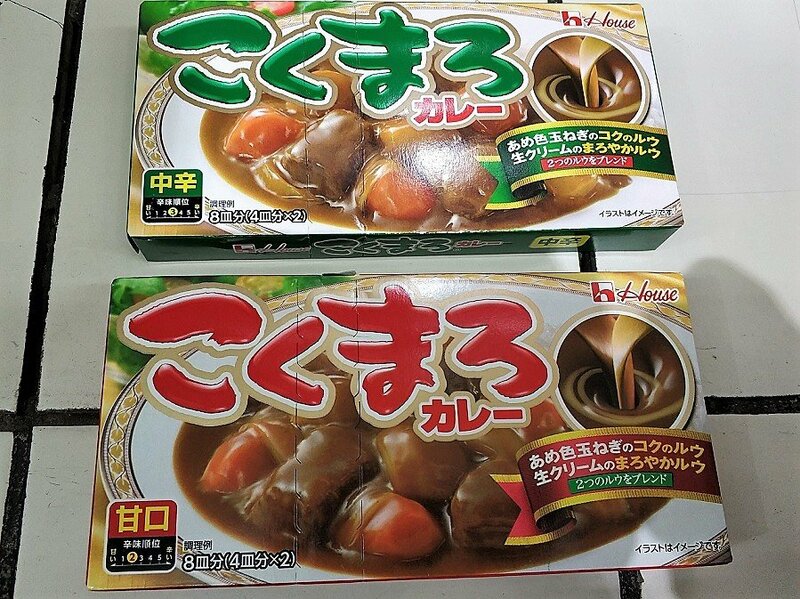 Lots of the curry sauces on sale at Walmart were marked "Japanese Style" 日式。Not sure why. Reading up on curry just now shows a huge variety of approaches. I even found one article calling it "The national dish of England." 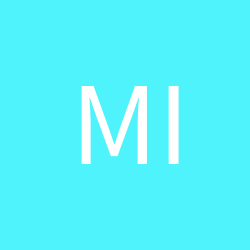 In a Chinese mind, curry is always Indian, noting to do with local flavor. Anyhow, I guess the curry powder/block is more JP style/flavor after I eat around North India and South India. In fact, south India curry is far from what eat here or in JP everyday. 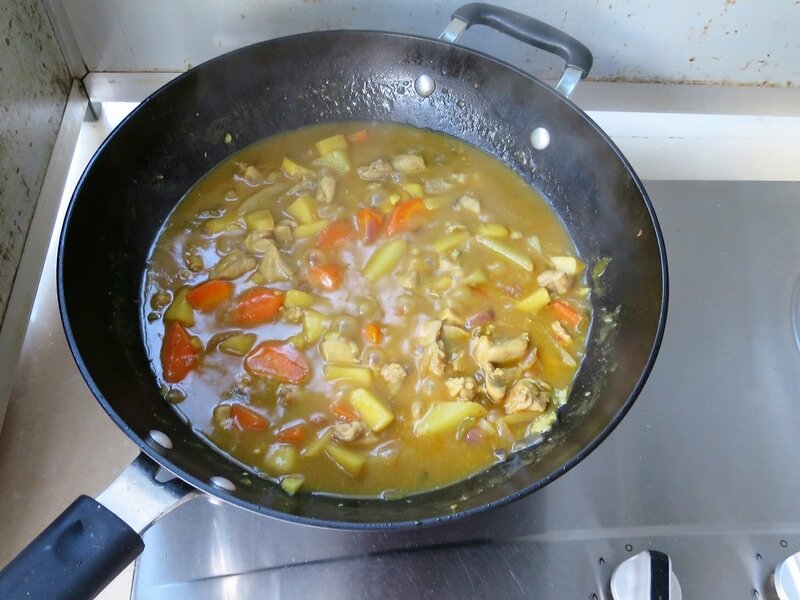 I have a wild guess that Curry is brought to south-southeast Asia by British Indian and finally it's part of the Navy's daily supply, tasty and full of energy, easy to carry and stock .that's for the seaman's. 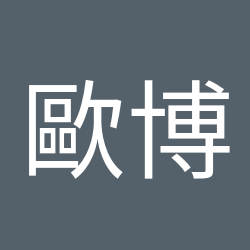 BTW, China is following JP in all aspects since 19xx, lot of new words till today we took from Japanese Kanji to represent new things, They are our teachers, the characters writes the same, why not borrow? Yes, that makes good sense. Thanks. Definitely nothing to do with the navy eating curry. You are correct that the navy will have had a big role but only because of the spice trade and helping to maintain the British empire. Stretching from the empire up until present day Britain has had and still has Indian immigrants. Of course, over time they become British themselves.. so much so this is the largest minorrit ethnic group in the U.K. Of course they brought their food with them. 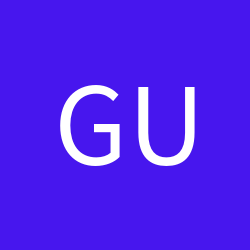 This was eventually adapted slightly for local tastes (although not always) and it took off. Curry is the most popular food in Britain according to various surveys and reports; thus it got the title of “the national dish”. It is true that there seem to be Indian restaurants and curry houses in every town or decent sized village in the U.K..
Back to China... I think it’s labelled as Japanese for marketing purposes. Also because Japanese curry isn’t like Indian or South East Asian and likely to be more agreeable to the Chinese palette . 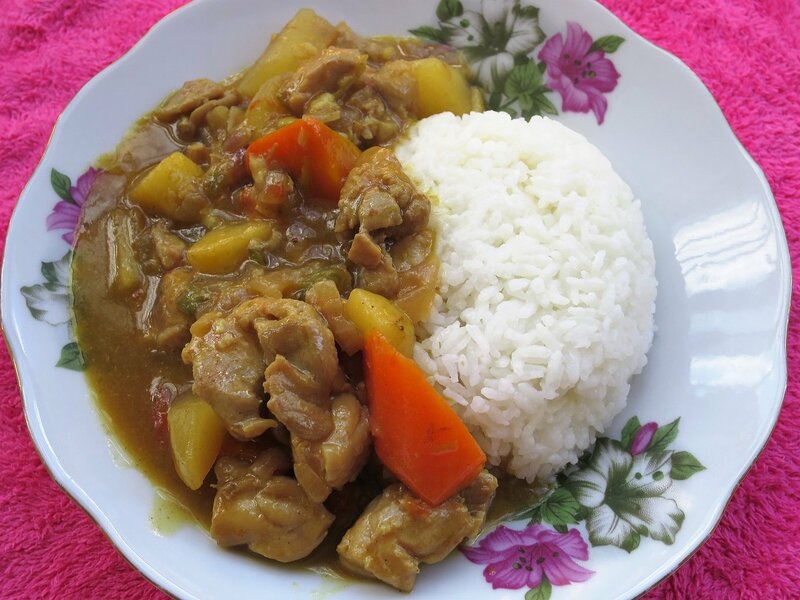 Japanese curry is quite well know throughout SE Asia and usually served as just a curry sauce on a deep fried cutlet and rice. Curry is the most popular food in Britain according to various surveys and reports; thus it got the title of “the national dish”. It is true that there seem to be Indian restaurants and curry houses in every town or decent sized village in the U.K.. I had seen a reference to this, but wasn't sure it was still true today. Good to have a "local view." Thanks. The only thing i can not agree the British spice trade, it is OPIUM!!!!!!! Pretty sure no opium these days. Not on that level anyway. 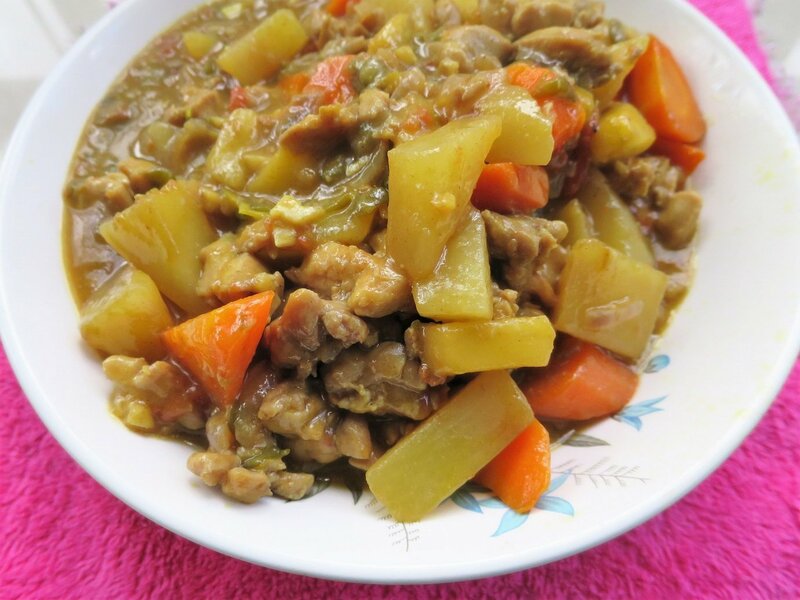 It ought to be noted that Japanese カレー karē has always been thought of as 洋食 yōshoku, Western-inspired food introduced during the Meiji Restoration, and was introduced to Japan by the British navy, through the medium of a standard curry powder mix based on a flour- and butter-based roux. 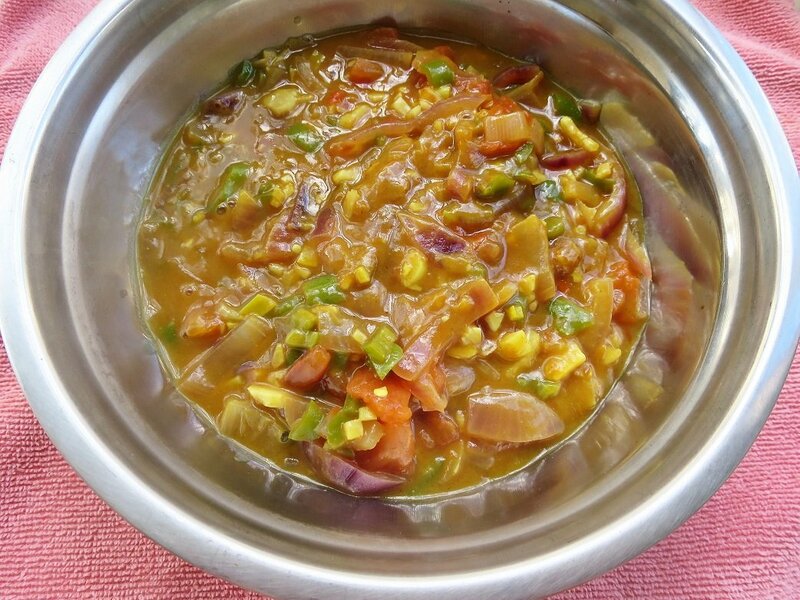 Thus they are very much a thick sauce with a relatively low spice level for an Indian palate. Throughout the Indian subcontinent, "curry" is basically tantamount to saying sauce (the English word comes from Tamil கறி kaṟi). 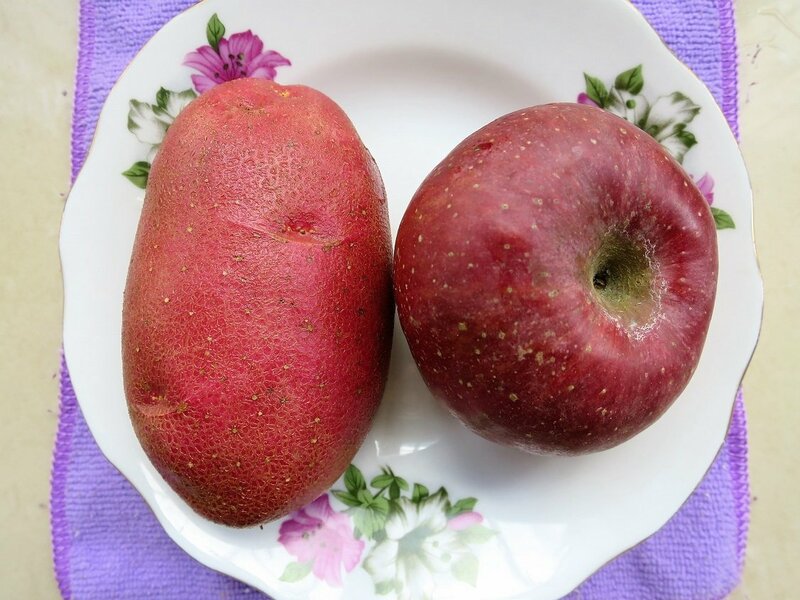 EDIT: The use of apple is dead giveaway for a Japanese-inspired curry, as based on Victorian British recipes (e.g. Mrs. Beeton's Curried Fowl). These were superseded in Britain by a range of North Indian curries post-WW2 (+ substantial innovation). good point , sauce rather than spice..... it is a mixture of many thing , especially in south Indian, majority is vegetarian, curry is the sauce for rice in a simple meal: you mix green or red curry thin sauce with rice and rolling to a rice ball in your hand and eat. There's one ingredient missing. It's honey, I usually use honey when I cook curry, and it makes the meal delicious. 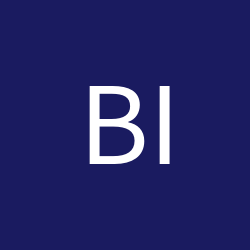 Thanks for your comment @backwards -- and welcome to the forum. You are right in saying that lots of recipes call for it. I think the issue of whether or not to add honey depends mainly on how much sweetness is contained in the curry sauce or curry powder you are using, as well as how sweet some of the other ingredients are. 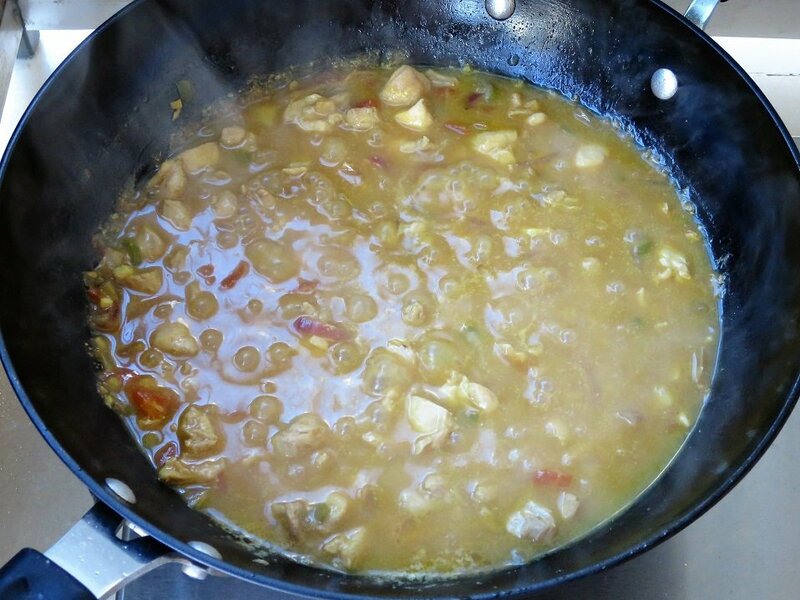 If you prefer your curry to have a more sweet taste, it's certainly fine to add some honey near the end. Curry is one of those flexible dishes that can easily be adapted to suit your personal taste preferences.